Saturday, January 20th 2018 – Illustrated talk: The epiphytes of Monteverde: Part 2. Nick Hinton (PH). Saturday, February 10th 2018 – Illustrated talk: Bulbophyllum scent – A role to attract pollinators. Archie Smith (PH). Saturday, March 10th 2018 – Illustrated talk: Crossing orchids and sowing seed. Robin Hall (PH). Saturday, April 14th 2018 – Illustrated talk. Paphs! Hywel Griffiths (PH). Saturday May 19th 2018 – Illustrated talk: Orchids from seed to flowering plant. Terrestrials and Epiphytes Lynda Coles (PH). Saturday, May 26th 2018 – Orchid Day at Dyffryn Gardens TBC. Sunday, June 10th 2018 – Field trip to see native wild orchids at Kenfig Nature Reserve, Bridgend, to be led by Dr Roy Bailey-Wood. Meet at 2.00pm in the visitor centre. Non- members welcome. Read about it here. Saturday, July 14th 2018 – Illustrated talk: The Eric Young Orchid Foundation. Dr. Richard Kellett (PH). DUE TO CIRCUMSTANCES BEYOND OUR CONTROL, THE ADVERTISED TALK HAS HAD TO BE CANCELLED. The meeting on this date is for members only. Saturday, August 11th 2018 – Practical workshop: Simple techniques for super orchid photos. Dr. Helen Millner (PH). REMEMBER TO BRING YOUR CAMERAS! Saturday and Sunday September 1st – 2nd 2018 – Welsh Orchid Festival (Marquee). Details now posted. Saturday, September 22nd 2018 – Annual General Meeting (PH). Saturday, October 13th 2018 – Illustrated talk: Pollination mechanisms in some British orchids. Roy Bailey-Wood. (PH). Saturday, November 17th 2018 – Illustrated talk: Penllergare revisited. Jennie Eyers (PH). Saturday, December 2018 – OSG Christmas Dinner. Lynne Harrendence to confirm date, time, venue and other details nearer the date. No meeting. Meet at venue. Saturday, January 21st 2017 – Illustrated talk: My top twenty orchids: orchids in cultivation and the wild. Simon Pugh-Jones of Writhlington School (PH). Saturday, February 11th 2017 –– Illustrated talk: Some aspects of orchid history: a review. Dino Zelenika (PH). Saturday, April 8th 2017 – Illustrated talk. Orchid hunting in Sumatra. Trey Sanders (PH). Saturday May 13th 2017 – Illustrated talk: The epiphytes of Monteverde. Nick Hinton (PH). Saturday, May 20th – Orchid Day at Dyffryn Gardens. Saturday, June 2017 – Field trip. Date, time and venue to be confirmed nearer the time. Non-members welcome. Saturday, July 15th 2017 – Illustrated talk: Extreme methods of orchid culture. Malcolm Perry (PH). Saturday, August 12th 2017 – Illustrated talk: The King Charles I School Orchid Project. Philip Seaton (PH). Saturday, September 16th 2017 – Annual General Meeting (PH). Saturday, November 18th 2017 – Constructing an epiphyte branch: a practical demonstration. Nick Hinton (PH). Saturday, December 2017 – No meeting. Saturday, January 16th 2016 – Future event planning (PH). Saturday, February 13th 2016 –– Illustrated talk: The genus Dracula –have you been bitten yet? Trey Sanders (PH). Saturday, April 16th 2016 – Illustrated talk. Orchids on the brink of extinction- identifying future reintroduction sites for the endangered Fen Orchid (Liparis loeselii). Dr. Wendy Harris of Swansea University. (PH). Saturday, April 30th 2016 – An early Spring field trip to see Early Purple Orchids .. Orchis mascula … venue to be confirmed nearer the time. Non members welcome. Saturday, May 14th 2016 – Illustrated talk: Reintroducing wild orchids to lost habitats – from seed to plant. Dr. Wilson Wall of Bewdley Orchids (PH). Saturday, June 2016 – Instead of the usual June field trip, this year there will be two field trips … one on April 30th and one on August 27th. Venues to be confirmed nearer the time. Non-members welcome. Please see appropriate entries. Saturday, July 16th 2016 – Illustrated talk: Orchids of Madagascar. Trey Sanders (PH). Saturday, August 13th 2016 – Illustrated talk: Discovering New World Orchids. Steve Manning (PH). Saturday August 27th 2016. – Late Summer field trip to see Autumn Ladies Tresses .. Spiralis spiranthes .. Venue to be confirmed nearer the time. Non members welcome. Saturday and Sunday September 3rd – 4th 2016 – Welsh Orchid Festival (Marquee). Saturday, September 17th 2016 – Annual General Meeting (PH). Saturday, October 15th 2016 – Orchid Growers’ Question Time (PH). Saturday, November 12th 2016 – Illustrated talk: Orchid hunting in Ecuador. Christopher Squire (PH). Saturday, December 2016 – OSG Christmas Dinner. Lynne Harrendence to confirm time, venue and other details nearer the date. No meeting. Meet at venue. Saturday, January 17th 2015 –Talk: Fangs for the memories: A two-part presentation on growing Dracula species and reminiscences of looking for orchids in south-east Asia. Peter Rees-Jones (PH). Saturday, February 14th 2015 – Talk and discussion: The contribution of the Ancients and the use of Latin in modern botany. Dr. Kevin L. Davies (PH). Saturday, March 14th 2015 – Illustrated talk: Masdevallia revisited. Dr. Roy Bailey-Wood (PH). Saturday, April 18th 2015 – Film: The fatal flower. Malcolm Perry (PH). Saturday, May 16th 2015 – Illustrated talk: Orchid hunting in Chiang Rai, close to the Golden Triangle. Bernard McDonald (PH). Saturday, June 2015 – Field trip to Gower led by Alan Gregg. Date, time and venue to be confirmed nearer the date. Non-members welcome. Saturday, July 18th 2015 – Illustrated talk: Australian orchids Part 2. Trey Sanders (PH). Saturday, August 15th 2015 – Talk: From seed to blossom; recollections of the first decade of OSG. Dr. Kevin L. Davies, with contributions from various OSG members (PH). Saturday and Sunday September 5th – 6th 2015 – Welsh Orchid Festival (Marquee). Saturday, September 19th 2015 – Annual General Meeting (PH). Saturday, October 17th 2015 – Illustrated talk: A rose by any other name…..but how do you prune it? Aspects of orchid taxonomy. Marios Giannakoulias (PH). Saturday, November 14th 2015 – Illustrated talk: Some aspects of orchid history: a review. Dino Zelenika (PH). Saturday, December 12th 2015 – Illustrated talk: Wild orchids of Breconshire. John Crellin; Joint BSBI Recorder for Brecknockshire (PH). Saturday, December 19th 2015 – OSG Christmas Dinner. Lynne Harrendence to confirm time, venue and other details nearer the date. No meeting. Meet at venue. Saturday, January 18th 2014 – Illustrated talk: Growing paphiopedilums. Dino Zelenika (PH). Saturday, February 15th 2014 – Talk and discussion: What orchid books don’t tell you. Dr.Kevin L. Davies (PH). Saturday, March 15th 2014 – Illustrated talk: Unpredictable pleurothallids. Steve Manning (PH). This talk is generously funded by The Orchid Society of Great Britain. Saturday, April 12th 2014 – Illustrated talk: What’s new in orchids? Malcolm Perry (PH). Saturday, May 17th 2014 – Illustrated talk: Phalaenopsis species for the home. Francis Quesadad-Pallares. (PH). Saturday, June 14th 2014 – Proposed trip to the Malvern International Orchid Show: Details to follow. Non-members welcome. Saturday, June 21st 2014 – Field trip to Vicarage Meadows Nature Reserve (OS map sheet 147, Grid reference SN 850 526) near Abergwesyn (Post Code LD5 4TP), Powys, home to the Greater Butterfly Orchid (Plantanthera chlorantha), Fragrant orchid (Gymnadenia conopsea) and the rare, Small White Orchid (Pseudorchis albida). Meet at entrance to Nature Reserve at 12pm. Leader John Crenllin (Vice County Recorder for Brecknockshire – The Botanical Society of Great Britain). Also, possibly, annual orchid count with Phil Sutton (Brecknock Wildlife Trust). Non-members welcome. Saturday, July 19th 2014 – Practical session: Orchid flowers through the microscope. Dr. Kevin L.Davies. (WDL). Saturday, August 16th 2014 – Illustrated talk: A year in the orchid house. Alex Luker, Head Gardener at Dyffryn House (PH). Saturday and Sunday September 6th-7th 2014 – Welsh Orchid Festival (Marquee). Saturday, September 20th 2014 – Annual General Meeting (PH). Saturday, October 11th 2014 – Illustrated talk: Miniature Vandaceous Orchids. Trey Sanders (PH). Saturday, November 15th 2014 – Illustrated talk: The Jane Phillips Award – A photograph of an orchid house. Laura Reeves, Winner of the Jane Phillips Award (PH). Saturday, December 6th 2014 – Proposed trip to Burnham Orchid Nurseries. Details to follow. Non-members welcome. Saturday, December 20th 2014 – Orchid Gardeners’ Question Time. Various participants. Have your orchid questions answered, exchange your surplus plants and socialize over a mince pie (PH). Saturday, January 19th 2013 – Illustrated talk: Bosnian orchids; an update. Dino Zelenika (PH). Saturday, February 16th 2013 – Illustrated talk: Aspects of orchid evolution. Dr. Roy Bailey-Wood (PH). Saturday, March 16th 2013 – Illustrated talk: Chysis, Xylobium and other neglected genera. Dr. Kevin L. Davies (PH). Saturday, April 20th 2013 – Illustrated talk: Malcolm Perry (PH). What’s new in orchids? Saturday, May 18th 2013 – Illustrated talk: A personal orchid journey. Dino Zelenika (PH). Saturday, June 15th 2013 – Visit to Kenfig National Nature Reserve. A talk on the Sand Dune Rejuvenation Programme designed to help the rare and steeply-declining population of the Fen Orchid (Liparis loeselii) to extend its territory, followed by a walk in the dunes to see the Fen Orchid and the many other species of rare orchids that grow in the reserve. July 2013 – A visit later in the orchid season to Kenfig NNR is also planned in order to see the rare Epipactis species in the dune system. Date dependent on flowering times. 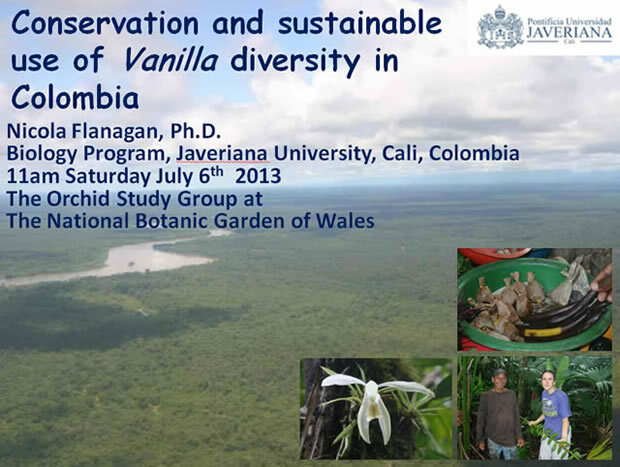 Saturday July 6th 2013 – Conservation and sustainable use of Vanilla diversity in Colombia. Nicola Flanagan, Ph.D.
Saturday, July 13th 2013 – A visit to the orchid collection at Singleton Park, Swansea, followed by a re-potting and mounting demonstration. Alan Gregg. Meet at gate to the “Botanics” at 11.00am. Saturday, August 17th 2013 – Talk and discussion: What orchid books don’t tell you. Dr. Kevin L. Davies (PH). Saturday and Sunday August 31st – September 1st 2013 – Welsh Orchid Festival (Marquee). Details to follow. Saturday, September 21st 2013 – Annual General Meeting (PH). Saturday, October 12th 2013 – Illustrated talk: The Jewel Orchids. Trey Sanders (PH). Saturday, November 16th 2013 – Illustrated talk: A few more of my favourite orchids. Christopher Squire (PH). Saturday, December 21st 2013 – Orchid Gardeners’ Question Time. Various participants. Have your orchid questions answered, exchange your surplus plants and socialize over a mince pie (PH). Saturday, January 21st 2012 – Illustrated talk: Classic Cattleya cultivars for the connoisseur. Dr. Kevin L. Davies (PH). Saturday, February 11th 2012 – Illustrated talk: Creative orchid growing. Trey Sanders (PH). Saturday, March 10th 2012 – Illustrated talk: Saving Darwin’s orchids. Phil Seaton, Royal Botanic Gardens, Kew (PH). Saturday, April 21st 2012 – Illustrated talk: The principles of judging orchids. Dr. Richard Kellett (PH). Saturday, May 12th 2012 – Illustrated talk: Orchids of the Nilgiri Hills. Malcolm Perry (PH). June 2012 – Two field trips to be organised. Details to follow. Saturday, July 14th 2012 – Illustrated talk: Practicalities of orchid hunting. Sue and Pat O’Reilly (PH). Saturday, August 11th 2012 – Illustrated talk: The genus Renanthera. Trey Sanders (PH). Saturday and Sunday September 1st and 2nd September 2012 – Welsh Orchid Festival (Marquee). Details to follow. Saturday, September 15th 2012 – Annual General Meeting (PH). Saturday, October 13th 2012 – Illustrated talk: Some personal favourites. Dr. Kevin L. Davies (PH). Saturday, November 17th 2012 – Illustrated talk: Following in the footsteps of the old orchid hunters. Christopher Squire (PH). Saturday, December 15th 2011 – Orchid Gardeners’ Question Time. Various participants. Have your orchid questions answered, exchange your surplus plants and socialize over a mince pie (PH). Saturday, January 22nd 2011 – Illustrated talk: The genus Dendrochilum. Trey Sanders (PH). Saturday, February 12th 2011 – Illustrated talk: Orchid highlights from Italy’s Gargano Peninsula. Sue Parker and Pat O’ Reilly (PH). Saturday, March 12th 2011 – Illustrated talk: Tuberous orchids of Greece. Marios Giannakoulias (PH). Saturday, April 16th 2011 – Illustrated talk: Aeridinae species to know and grow. Dr. Kevin L. Davies (PH). Saturday, May 14th 2011 – Illustrated talk: The orchids of Bosnia and Herzegovina. Dino Zelenika (PH). Saturday and Sunday June 18th and 19th 2011 – Group visit to Anglesey to see various native orchids. Saturday, July 16th 2011 – Illustrated talk: Endangered and extinct orchids. Trey Sanders (PH). Saturday, August 13th 2011 – Talk: The orchid nectary. Dr. Kevin L. Davies (PH). Saturday and Sunday September 3rd -4th 2011 – Welsh Orchid Festival (Marquee). Details to follow. Saturday, September 17th 2011 – Annual General Meeting (PH). Saturday, October 15th 2011 – Illustrated talk: Stanhopea species and hybrids. Kelvin Bush of Bush Orchids (PH). Saturday, November 19th 2011 – Illustrated talk: Australian Orchids. Trey Sanders (PH). Saturday, December 17th 2011 – Orchid Gardeners’ Question Time. Various participants. Have your orchid questions answered, exchange your surplus plants and socialize over a mince pie (PH). Saturday, January 23rd 2010 – Talk and demonstration: Practical Orchid Cultivation. Ann Maloney and Peter Hoare (WDL). Saturday, February 13th 2010 – Illustrated talk: Whatever happened to Maxillaria? – How the genus has recently been revised in the light of DNA studies. Dr. Kevin L. Davies (PH). Saturday, March 13th 2010 – Illustrated talk: Following his popular talk two years ago, Tom Hart Dyke of Lullingstone Castle returns by public demand and fresh from his latest adventure to give an illustrated talk on: Plant hunting in Bolivia and Ecuador. This talk is open to the public, but tickets (£12) are limited and will need to be reserved well in advance [Tel: Lynne Harrendence 01558 668492] (PH). Saturday, April 17th 2010 – Talk: A little something that I prepared earlier – Growing orchids from seed in the kitchen. Robin Hall (PH). Saturday, May 15th 2010 – Illustrated talk: The Orchid Flora of Bulgaria. Pat O’Reilly and Sue Parker (PH). This talk will launch the European Orchid Sub-group (EOS). Saturday, June 5th 2010 –Field trip to Cae Blaen Dyffryn (near Lampeter) to see Platanthera chlorantha and P. bifolia (Greater and Lesser Butterfly Orchids, respectively). Saturday and Sunday, June 12th – 13th 2010 – Proposed, residential field trip to Gait Barrows Nature Reserve, Lancashire to see Cypripedium calceolus (Lady’s Slipper Orchid), Corallorhiza trifida (Coralroot Orchid) and possibly, Epipactis atrorubens (Dark Red Helleborine). Details to follow. Saturday, July 17th 2010 – Illustrated talk: Unusual Orchids. Malcolm Perry (PH). There will be a variety of unusual orchid species for sale at this event. Saturday, August 14th 2010 – Illustrated talk: – These are a few of my favourite things. Christopher Squire (PH). Saturday and Sunday September 11th – 12th 2010 – Welsh Orchid Festival. Details to follow. To be held at the National Botanic Garden of Wales. Saturday, September 18th 2010 – Annual General Meeting (PH). Saturday, October 16th 2010 – Cattleyas for Quality and Colour. Dr. Kevin L. Davies (PH). Saturday, December 18th 2010 – New Challenges for a New Year – an open forum to discuss plans for the year ahead, cultivation problems etc and an opportunity to exchange surplus plants and socialize over a mince pie (PH). Saturday, January 17th 2009 – Illustrated talk: The Writhlington Orchid Project – Adventures in Orchid Conservation. Mr. Simon Pugh-Jones and students of Writhlington School (PH). Saturday, February 14th 2009 – Illustrated talk: Orchidaceae redefined or What is an orchid? – how our concept of the orchid family has changed over the years. Dr. Kevin L. Davies (PH). Saturday, March 14th 2009 – Illustrated talk: Wild orchids of the Burren. Pat O’Reilly and Sue Parker (PH). Saturday, April 18th 2009 – Illustrated talk: The genus Coelogyne – its botany and cultivation. Dr. Kevin L. Davies (PH). Saturday, May 16th 2009 – Illustrated talk: Bulbophyllum revisited. Following his popular talk on this remarkable genus back in 2007, Bernard McDonald returns with his second presentation (PH). Saturday, June 13th 2009 –Joint field visit with the Llanelli Naturalists to Waun y Gwiel Fach Farm, situated between Four Roads and Pontnewydd / Pontyates at SN 449086. Hosted by Andrew Stevens and led by Andrew Stevens and / or Richard Pryce. Meet at farm at 11am prompt. Saturday, July 18th 2009 – Illustrated talk: A fine balance – various aspects of the orchid-fungus relationship. Drs Damian Donnelly and Philip Jones (PH). Saturday and Sunday September 5th – 6th 2009 – Welsh Orchid Festival (Marquee). Details to follow. Saturday, September 26th 2009 – Annual General Meeting (PH). Saturday, October 17th 2009 – Orchid Tourism. Peter Rees-Jones (PH). Saturday, November 14th 2009 – Illustrated talk: Wild orchids of the Lot Valley, France. Pat O’Reilly and Sue Parker (PH). Saturday, December 19th 2009 – New Challenges for a New Year – an open forum to discuss plans for the year ahead, cultivation problems etc and an opportunity to exchange surplus plants and socialize over a mince pie (PH). Saturday, January 19th 2008 – Illustrated talk: So Last Season! – orchid species that, for one reason or another, are no longer fashionable in collections. Dr. Kevin L. Davies (PH). Saturday, February 16th 2008 – Illustrated talk: A selection of European orchids; an orchid travelogue. Muriel Crocker (PH). Saturday, March 1st 2008 – Guest speaker, Mr. Tom Hart Dyke, author of The Cloud Garden and creator of The World Garden at Lullingstone Castle, will relate his experience of being taken hostage whilst orchid hunting in South America. Admittance to this event is open to all and will be by ticket only at £10, available from members of the Orchid Study Group. Limited number of places so please book early. Note that the talk will be held in the Paxton Room (upstairs in Principality House) and will begin at 2pm prompt (PH). Saturday, April 12th 2008 – Illustrated talk: Cultivating cool-growing, Himalayan Dendrobium species. Dr. Kevin L. Davies (PH). Saturday, May 10th 2008 – Illustrated talk: The orchids of Carmarthenshire. Mr. Richard Pryce (Ex-president of The Botanical Society of the British Isles and plant recorder for Carmarthenshire). Saturday, June 21st 2008 – Field trip to Crymlyn Burrows, Swansea. Guided walk led by Jamie Bevan (Countryside Council for Wales). As nature reserves go, Crymlyn Burrows has an impeccable pedigree. It is an SSSI, a National Nature Reserve, a SAC and a RAMSAR site, home to a wide range of endangered, native plant species. Orchid-wise, species of Dactylorhiza predominate. Meet at the Reserve Centre, off Fabian Way at 11am prompt. Contact us for a map. Saturday, July 19th 2008 – Illustrated talk: Growing orchids my way. Mr. Christopher Squire (PH). Saturday, August 16th 2008 – Talk and visit: Starting from scratch; establishing the orchid collection at the National Botanic Garden of Wales. Ann Maloney & Mr. Peter Hoare (PH and the tropical house). Saturday and Sunday September 6th – 7th 2008– Welsh Orchid Fair (Marquee). Details to follow. Saturday, September 20th 2008 – Annual General Meeting (PH). Saturday, October 25th 2008 – British Orchid Congress Show, Dawlish Warren. Proposed trip – details to be announced. Saturday, December 20th 2008 – New Challenges for a New Year – an open forum to discuss plans for the year ahead, cultivation problems etc and an opportunity to exchange surplus plants and socialize over a mince pie (PH). Saturday, January 20th 2007 – Talk and demonstration: Basic orchid cultivation techniques. Dr. Kevin Davies (WDL). Saturday, February 17th 2007 – Talk: The orchid collectors Hugh Low and James Motley (ex Llanelli) and their work in Borneo. Mr Raymond Walker (PH). Saturday, March 17th 2007 – Talk and demonstration: Orchid photography. Mr. Howard Jones from the Department of Adult Continuing Education (DACE), Swansea University, in conjunction with his students, past and present (PH). Remember to bring any plants you may have in flower and also your cameras. Saturday, April 21st 2007 – Illustrated talk: The wild orchids of Wales. Dr. Roy Bailey-Wood (PH). Saturday, May 19th 2007 – Illustrated talk: The orchids of S. E. Asia. Mr Malcolm Perry. There will be unusual orchid species for sale so come prepared (PH). If you are looking for a particular species, let me know in advance and I’ll ask him to bring it for you. Saturday, June 23rd 2007 – Field Trip to Kenfig Burrows. Meet at the Reserve Centre 10am. Saturday, July 21st 2007 – A series of short orchid talks by members followed by Orchid Gardeners’ Question Time (PH). Saturday, August 18th 2007 – Illustrated talk: The genus Bulbophyllum. Mr. Bernard McDonald (PH). Saturday, September 15th 2007 – Annual General Meeting (PH). Saturday, October 20th 2007 – Talk and demonstration: Recent trends in orchid pollination studies and techniques. Dr. Kevin Davies (WDL). Saturday, November 17th 2007 – Illustrated talk: Slippers in the house; experiences with Phragmipedium. Dr. Hazel Weldon & Mr. Phillip Belcher (PH). Saturday, December 15th 2007 – New Challenges for a New Year – an open forum to discuss plans for the year ahead, cultivation problems etc and an opportunity to exchange surplus plants and socialise over a mince pie (PH). Saturday, January 21st 2006 – Illustrated talk: Orchids for the Cool Greenhouse. Dr. Kevin Davies (PH). Saturday, February 18th 2006 – Illustrated talk: Replicating a Rainforest in Rural Wales. Mr Ivor Stokes (former Director of Horticulture, National Botanic Garden of Wales) (PH). Saturday, March 18th 2006 – Illustrated talk: Cultivating and Caring for Cymbidiums. Mr. David Sandy & Mr. Alistair Sandy (Preseli Orchids) (PH). Saturday, April 15th 2006 – Easter Trip to Burnham Nurseries. Saturday, May 20th 2006 – Practical, lab-based class. Orchid Roots and Leaves – Form and Function. Dr. Kevin Davies (WDL). Saturday, June 24th or Sunday, June 25th 2006 (To be confirmed) – Summer Trip to the Annual International Orchid Fair at Newbury. Saturday, July 22nd 2006 – Talk: Orchids and their place in the Ordinary Garden. Miss Jacky Pugh (PH). Saturday, August 19th 2006 – Guided Tour of Singleton Gardens, Swansea and the Orchid Collection. Mr Alan Gregg (Swansea Botanical Complex). Saturday, September 16th 2006 – Illustrated talk: Growing Phalaenopsis hybrids. Mr. David Sandy & Mr. Alistair Sandy (Preseli Orchids) (PH). Saturday, October 21st 2006 – Illustrated talk: Magnificent Masdevallias. Dr. Roy Bailey-Wood (PH). Saturday, November 18th 2006 – Practical, lab-based class – The Orchid Flower – Its Structure and Evolution. Dr. Kevin Davies (WDL). Saturday, December 16th 2006 – New Challenges for a New Year – an open forum to discuss plans for the year ahead, cultivation problems etc and an opportunity to exchange surplus plants and socialise over a mince pie (PH).